Edisto is one of the few places in the world where people can kick back, relax, and have a great time doing nothing more than enjoying the simplicity of a beach vacation. Its small enough that once visitors roll into town and escape their real lives they can park their cars, put the keys in a drawer, and for a week or two completely forget they even own a car. This, of course, is only possible if those people decide to rent a golf cart for laid back cruising on Edistos shady streets. 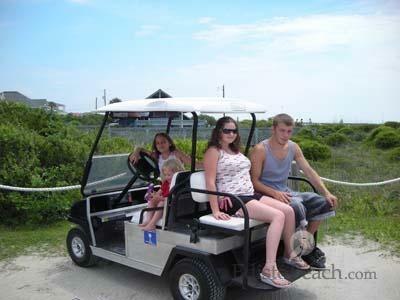 Palmetto Cart Rental is one company that many vacationers go to for their golf cart needs. The Ravenel based company offers both electric and gas carts, all of which seat four people. The carts can be rented by the weekend, week, or longer and prices vary from $185 to $315. A $100 deposit is required to reserve or the hold the cart which ensures carts are available for renters especially during the peak summer season. Although it is easy to forget while on vacation, rules still apply on Edisto Beach so golf cart operators need to remember that open container laws and all other driving-related laws still apply while driving or riding in a golf cart. Renting a golf cart enhances the Edisto experience by getting visitors to slow down and cruise to their favorite destinations. It gives vacationers a chance to forget being cooped up in an air conditioned car by taking a seat and enjoying the feeling of the fresh ocean breeze on a hot summer day that only Edisto can provide. Hello from Augusta Georgia! 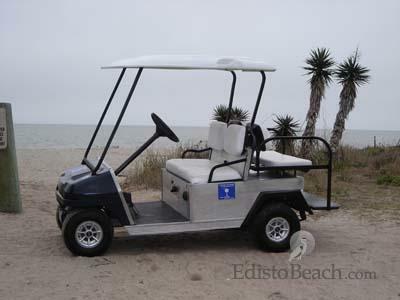 It would be great if someone could detail the requirements for bringing your own golf cart to Edisto. Thanks.